For Memorial Day Weekend, we decided to go backpacking in upper Sycamore Canyon Wilderness. There are several trails that join together to offer a few loop and shuttle hike opportunities. After our traditional McD’s breakfast burritos, we headed for Kelsey Trailhead. After dousing an abandoned campfire, we geared up in the morning chill and hit the trail. Unseasonable rains and cool weather were predicted for the weekend, and the morning was particularly chilly. We made the short, gorgeous hike to Babes Hole. 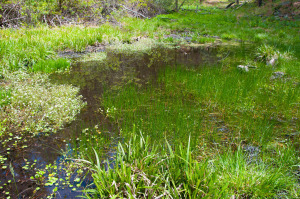 Unusual wet spring weather had brought wildflower and bright spring green vegetation to life. We set up a quick camp close to the spring, then headed down Little LO (i.e., Lookout) Trail. 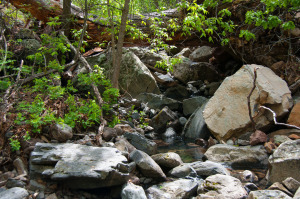 The hike runs pretty level for a short distance, then dives down to Sycamore Creek. It’s beautifully shady, and the oaks made a lovely green backdrop. After checking out a little viewpoint halfway down, we headed to Geronimo Spring near the bottom of the trail. We at lunch at the edge of a pool, and chatted with another couple we’d followed down as they went by on their way to explore a side canyon. After lunch, we continue on to the creek to explore the established campsites along the trail and get a better view of the canyon. The next day, we packed to and headed to Dorsey Spring. Kelsey Trail runs level through the forest for a while, then opens into more scrubby vegetation as it drops a bit, offering great views of the upper part of the canyon. 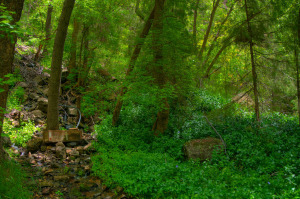 Dorsey Spring has a couple lovely little pools below it and a couple nice camp spots. We hung our bags and set out in the rain for Winter Cabin. We didn’t make it all the way to the cabin, but it was a lovely hike! The trail gets rougher and brushier, and we were very happy to be wearing pants in the chaparral. After hopping over a little pass behind a thumb formation, we were rewarded with stunning views down-canyon, and spotted what I believe was a red-tailed hawk perching in a dead tree near the trail. The last day, we packed up and hiked up Dorsey Trail. We left our packs at the trailhead, then walked the roads around a couple miles to get our truck. 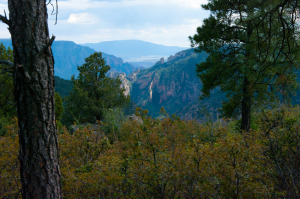 This entry was posted in Backpacks, Hikes, Outdoors, Trips and tagged backpacking, Dorsey Trail, flagstaff, hiking, Kelsey Trail, Little LO Trail, outdoors, Sycamore Canyon, Sycamore Canyon Wilderness, trail, wilderness by Deborah Lee Soltesz. Bookmark the permalink.